Last written in 104 days ago, huh? This blog isn’t dead, it’s just been… hibernating. Well, since I last wrote about LCA, it’s well and truly finished. As I mentioned in that post, I gave 2 talks and a lightning talk on Monday, the first day of miniconfs, so now there are videos. Distributed wikis (40 min), An approach to natural language generation (28 min), and Neurosexism (10 min). Shortly after LCA I moved house, and my new house was flooded, and one casualty was my desktop tower, which was sitting on the floor. (I assume the hard drive is probably OK, but since hooking my keyboard and monitor up to my netbook, I haven’t been so motivated to check.) So that was a big drama that was fairly disruptive (but my life has been back to normal for some months now). Anyway at the moment there are twothree geeky activities that I am actively pursuing. The first is attending Girl Geek Dinners Melbourne (see also Meetup, Facebook). They are being driven by Jes Lowry, who has done a great job at securing a suitable venue and being really dedicated about having events consistently, and even beyond that organising a really diverse set of events designed to interest as many different sets of girl geeks as possible. So if you are a geeky woman in Melbourne, I really recommend coming along sometime. The second is an attempt to start doing some Zookeepr hacking. Zookeepr is the conference software used by LCA, written in Python, uses the Pylons framework. Open source, natch. There was a code sprint-style event in mid April which was very useful as I was able to lean over the shoulder of someone else learning, and get an overview of the system components and how they came about and so on. Previously I was only familiar with the public/registrant components of the website, and the papers reviewing section (having been on the papers ctte for a couple of years). Naturally there is heaps of admin stuff that I had never seen, or even thought about existing. Just before the code sprint, the codebase was moved to Github, so learning enough Git to get by is also, well, overdue. Sidenote: Github is great, right, so why is their Issues system so rubbish? One thing I like to do when exploring a new project is poke around the bugtracker, try and make order from the chaos. Like assign tags/categories, fix tags, make new tags. Re-write a bug title/description to be more precise or explanatory. All that kind of stuff. Seems impossible if you are not a project admin in Github. One area Launchpad beats Github hands down, then, is in the issue tracking. My first attempted task is going to be working on a script for automated deployment. I’m going to try it in Fabric, being familiar with that from my workplace. Using Fabric seems quite common in Django-land, but I haven’t found many (anyone?) talking about using it with a Pylons project. I’m not sure if I should try and figure out why that is, or not. Finally I am making some progress in the world of Arduino. 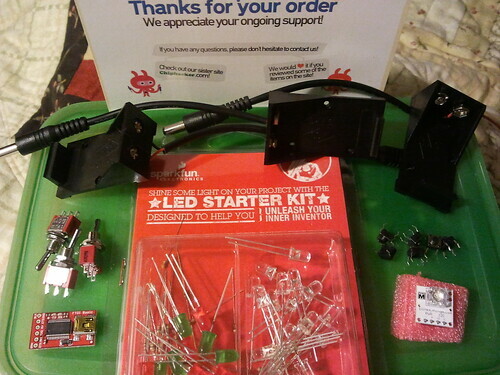 After LCA2010 I was inspired to buy a starter Arduino kit, and a Rainbowduino. However what the Rainbowduino offers in shiny, it completely and utterly lacks in beginner-friendly documentation. So after I bought it I tried to figure out how to use the Seeedstudio library to program it, but mostly failed, and then was rather stuck. So it all sat in a box for a long time for Another Day. Then a few months ago, Andy Gelme came and spoke at GGD Melbourne , and brought lots of toys. :) He encouraged us to come and get involved in the hackerspace. One of the other women who attended was interested in going along, and eventually we coordinated enough to go along to the weekly Tuesday workshops a couple of times. Our timing was not great as most attendees were busily working on their project for the Great Global Hackerspace Challenge. However I did some poking around and still made some small progress. One of my initial problems has been being able to successfully send programs to the Rainbowduino board. The recommendations on the web are to do it via another Arduino board. However I would often get an ‘avrdude’ error, which Google shed little light on. Last week Andy spent some time to sit down with me and suggested that the chip on my Arduino board may be getting the way, and intercepting my program instead of faithfully passing it onto the surrogate Rainbowduino board. (That’s my impression of what’s going on. :)) So he suggested using a FTDI board instead of an Arduino board as the messenger… which unequivocally worked! Success! The FTDI board is connected to the computer via miniUSB, which I already have a cable for, and to the Rainbowduino via jumper cables (there may be some soldering this week to make a connector thing suitable for my Rainbowduino… ooh-err!). Anyway in cursing the poor Seeedstudio documentation for the hundredth time, I reflected that I had not picked the gentlest introduction to Arduino by choosing a Rainbowduino. I thought, maybe there is something else I could use that could help me get a grip on I2C and so on before I worry about the Rainbowduino specifically. With a short bit of poking around I found the BlinkM, which is a “smart” multi-colour LED that has enough brains to run Arduino programs as a stand-alone thing. I’m not about to do that but I think it’s reasonably analogous to the Rainbowduino. And thankfully, the docs are EXCELLENT. So – progress, it’s happening.